Detoxify Get rid of the unhealthy foods and environmental factors making you sick.Nourish Fuel your body with the healthy micronutrients you need to thrive.Gather Build your community and surround yourself with supportive, positive people.Transform YOU can be part of the solution. It's a lot easier to change the world than you imagine! You'll discover amazing secrets, such as how to stop food cravings, why nuts are one of the best snack foods, time-saving habits, and how to catch dangerous ingredients hiding in food labels. 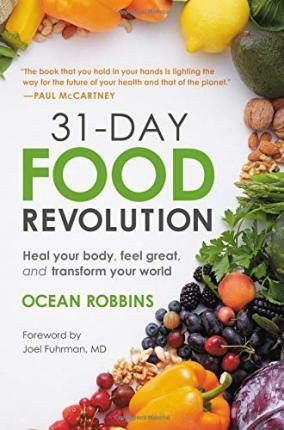 In his nonjudgmental and down-to-earth way, Ocean Robbins meets you wherever you are on your personal journey with food. Then, he provides you with tools that make it easy to eat less sugar, processed foods, and unhealthy animal products-and to happily enjoy whole plant foods, and more fair trade, local, organic, and otherwise consciously sourced fare. Ocean helps you make small improvements that lead to big results. If you want to feel better, enjoy your food more, and help sustain the planet, start reading this book today. In just 31 days you can change your health for the better. And your body will thank you for the rest of your life.